I just double check my lowest night on Saturday and it hit 19.4F while the airport was 5F, no joking! Finally getting some rain, with 100% precept tonight and tomorrow is going to be very dangerous with all that saturated wet snow. I have 20" of snow last time we got his much snow was in 1996. ( average snowfall is 6" year but spread out throughout winter) I think most of my palms and exotic are ok. Not sure about chamaedorea radicalis, could have some frond breaking underneath all that heavy snow. 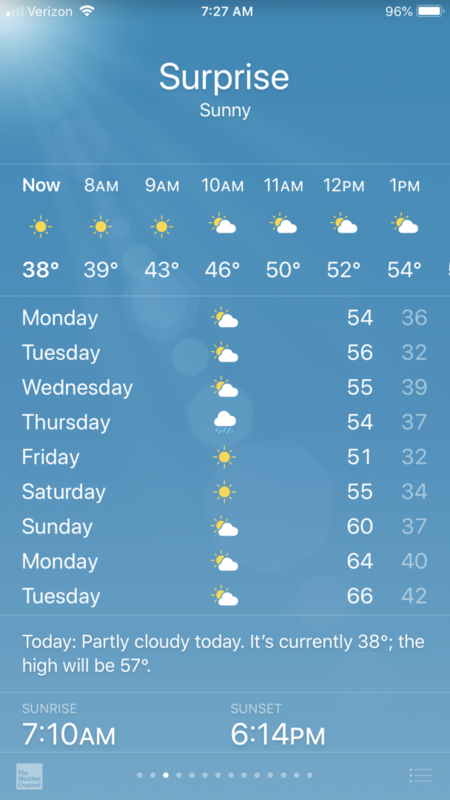 Finally seeing light at the end of the tunnel, highs will be in the 40's rest of the week. Rooting for you and your garden! 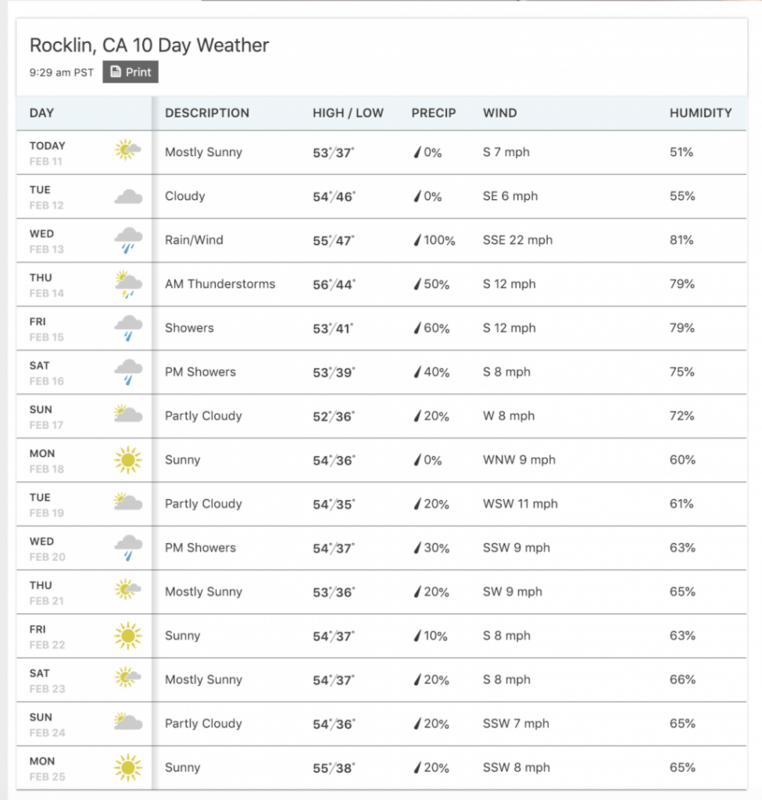 The weather here is more or less evolving to early "springlike" weather but cooler. Nights are cold but frostfree and highs later this week up to 13-14C/55-58F with endless sunshine no calm conditions. Because the mild winter some trees/shrubs are budding already and this will be even more with the weather forecasts. Update... chamaedorea radicalis are fine. Good to see. The DoomsDave radicalis I'm growing inside right now will be planted en masse outside this year. I'm sure the larger plants above helped to limit the snow hitting the ground somewhat. I'm still amazed at your climate, as I had thought the weather you've been having lately is more typical for a place at the same latitude as Wyoming and South Dakota. Any flooding in Seattle yet? There has been flooding here along the Columbia river with all the rain. It seems like the colder air shifting to the Eastern US is being delayed, as latest guidance is showing a stubborn North Pacific high staying in place. Latest forecasts have backed off on a possibility of freezing temps making it even close to N. FL. Yes the larger palms add tons of overhead protection without it they would have been damaged, but still alive. This winter was one for the record book. Snowiest February on record, the kids here are going to remember this snow event for the rest of their lives, lol. I was more worried about the lows but it wasn't that bad. My cordylines are a little flatten but ok, my camellia bush has one broken branch and melianthus major will die back. Street flooding is always a concern, but keeping the storm drains clean helps a lot. Indeed it has. Right now I don't trust models beyond 3 or 4 days.. As soon as that high starts breaking down, forecasts will be completely different. I don't mind it being cool (still Zone 10 for the winter) but it's the persistent cold here in Feb that needs to go. Daytime highs around 50 should be more like 65. Do you also grow Chamaedorea microspadix? If yes, how are they doing in the cold you have? 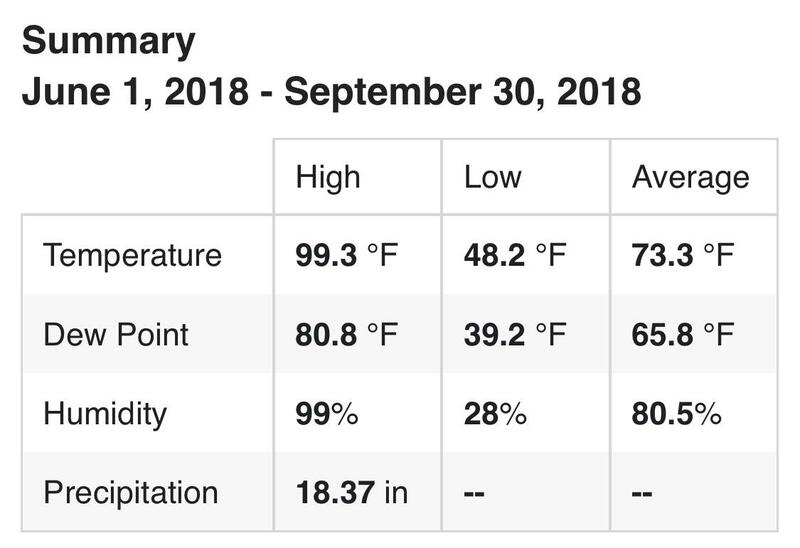 Hit 64.1F @ 4AM today. Extremely windy and rainy. Now the tropical storm is heading out and cold air is on its way from the north.. AGAIN! I have in the past but my experience has been the leaves are less hardy than C. radicalis, but the trunk is hardy. Don't grow any now. Sounds like a Pineapple express! Might give it a try over here as well. Heard indeed stories about the trund/root hardiness. You should defiantly try one, I love how they sucker like crazy. Darn, now I want one, LOL! Spring has definitely arrived in southern England. We have had a high of 60F today with clear, sunny skies. 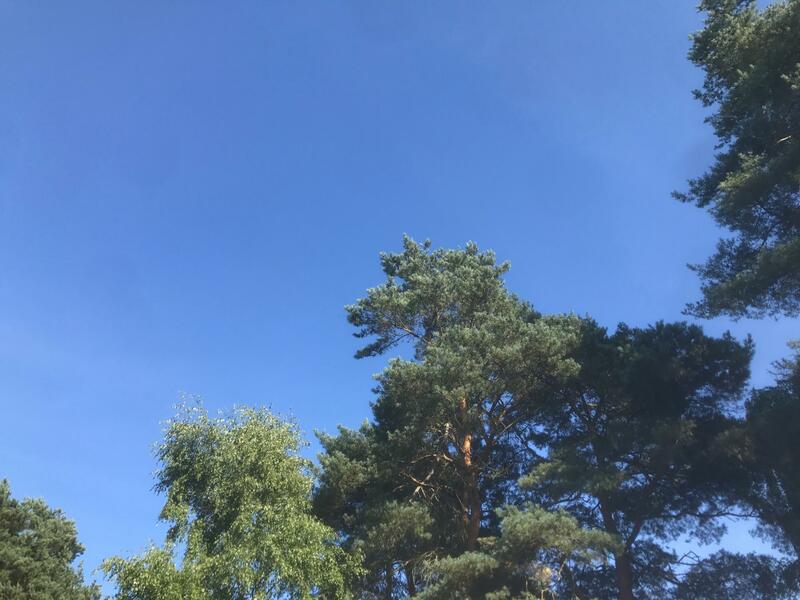 Not a cloud in sight. We're still having some chilly nights under the clear skies, but the days are glorious right now as they are really warming up. So much so that my Phoenix and Washingtonia are putting out ample new growth this past week. There's just so much more strength in the sun now and it is much higher up in the sky than it was 4-6 weeks ago. No chance of another cold snap now as the forecast looks good right into early March. Its definitely going to be one of the warmest February's on record. It's time to start germinating the peppers, tomatoes, cucumbers etc, this weekend. I have a feeling this spring/summer is going to be a lot hotter and drier than average, just like last year. This winter has been about as mild as you could possibly ask for at 51N. Promising signs for the growing season ahead. Almost 20 degrees in the garden today which is crazy for the time of year. Nice! enjoy it while it last, we are having one of the coldest February ever. My all-time record warm day in Feb. is 77F but that was many years ago. Great! enjoy the warmth, I am planting cordyline indivisia seeds this weekend, can't wait for March so we can warm up too. We're not out of the woods just yet. They're calling for a low of 2C for Tuesday (19th) at dawn. My lowest temp this winter has been 3.2C/37.7F (12/29/2018). I hope it stays that way. 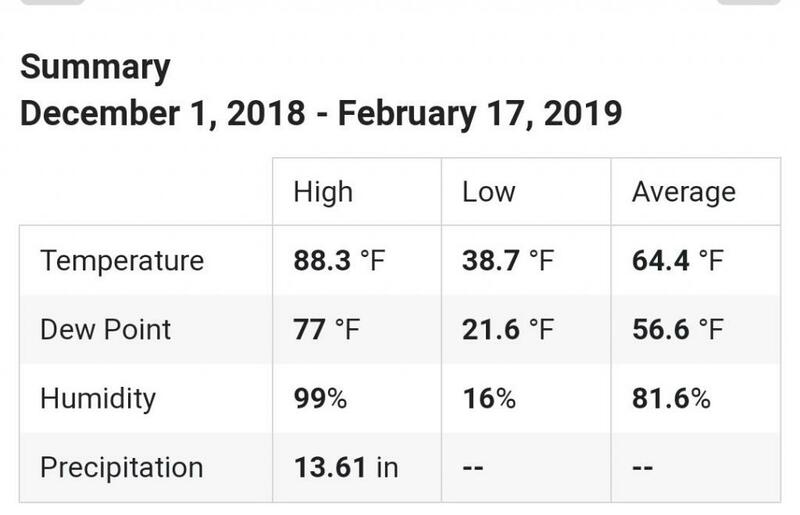 I had 1 night below 40F this winter in Orlando which was 37F. No damage seen. Forecast for next 2 weeks is pretty much 85/66 ever day. That would take us to March and the chance for freezing temps after that is very slim. 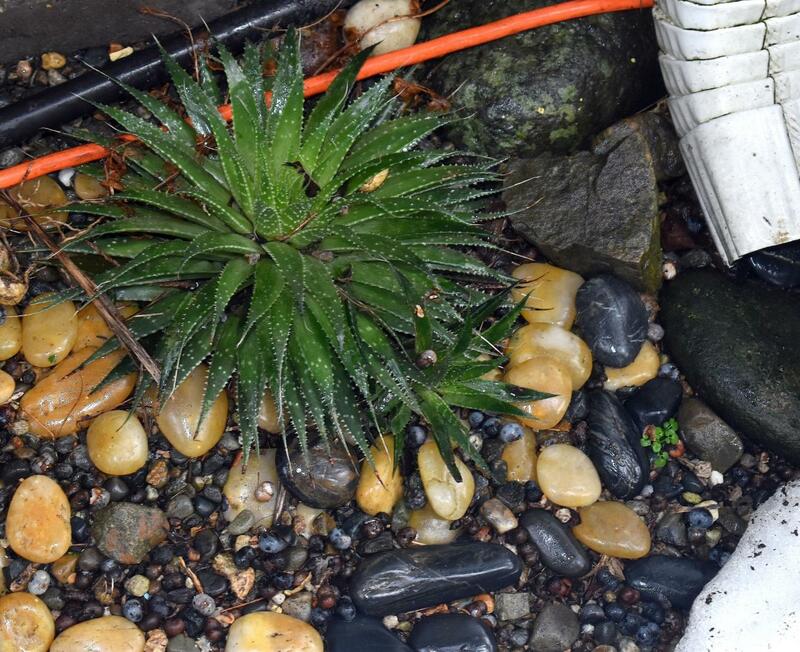 Wanted to show off how good aloe aristata did this winter. This is its third winter in the ground and doing good so far. As long as you keep it dry in winter it fairly hardy for me. This one is only growing in mostly shade and a good Aloe for z8, mine could use a little more sun right now. lol. All my feather palms have 2-3 leaves that are broken during the record snowfall. But otherwise, they make it in good shape. 20" of snow and half of it is gone and melting fast now. The snow pic was the first wave of snow of two snow events in 48 hrs. Yep, not ready to call it done just yet.. Were also expecting some cool /cold nights / days to close out the final week and a half of the month, along with some more possible showers / low elevation snow on and off thru next Friday /Sat.. While the valley didn't get nearly the anticipated rain amounts yesterday, today was humid and reached 68F after a blanket of thick, Seattle-like Fog cloaked the valley this morning. 60F forecast for tomorrow, then back to the 50's, for highs, for most of.. if not all of next week. Lows don't look too bad, mainly staying in the 35-38F range.. but we'll see. Still could see a couple mornings flirt with a quick frost.. Still, i don't think we'll see anymore sub- 30F readings this time around, at least not here in Chandler or within the developed parts of town. For the moment, overall -PNA pattern locked in overhead looks like it starts easing.. shoving the core of the coldest- than normal weather east, getting us and the entire Southwest, as well as a good chunk of central / So. CA. back into a more spring-ish' weather pattern around the 1st of March. Crossing my fingers that we can get rid of the cold.. but don't jump into any crazy, early heat. While anything is possible, latest check of the CFS / updated NMME longer range forecasts continues to suggest we could maintain a mild but not hot pattern through at least mid- March.. ( maybe well into April ..please, lol. ) this year. Hoping the high country can squeeze out at least one more good snow event before the season is done. Snow totals are currently averaging above normal up there for the time being. Won't completely erase the region's multiyear drought, but maybe ease things better than many recent winters couldn't. Regardless, very green across the deserts / foothills this year..
Yep! Just when I thought we were done we have another week of cool days and chilly nights. My plants are begging for a break. I think by this time next week we can call it a winter. But who knows. This has been one of the cooler and wetter winters I’ve experienced in the 10 years I’ve been here and I don’t enjoy it!! Agree.. except about not completely enjoying it, lol.. The extended stretch of nights in the 30s can end however, same w/ days stuck in the 50s. I'll take it over 3+ months of 110-116+F temps that will be here soon enough. Hoping i ( ..and the plants ) won't have to *enjoy* them again. Despite the colder winter this year, plants look fine, even the supposedly cold sensitive things in my collections. Anticipate a good push of growth on most things once we're out of this last cold spell..
I’m shocked my Ti plants are untouched! All of my palms seem to still be pushing growth even through the chill and damage over the last 6 weeks. I noticed with the 50f lows and rain last night things perked up a bit. My remaining Ginger, and palm seedlings ( inc. the *can't remember id* batch of Cocothrinax ) have been doing the same thing. Biggest surprise, thus far is my last remaining Orange Geiger.. a very cold sensitive species. While it dropped the bigger leaves it had produced, not showing any issues with being outside on the patio since the start of Jan., and receiving a bit more moisture than it might like this time of year. Sibling seedlings that came up in the same pot ..around the same size as this one, croaked last winter..
Only thing that's had issues this year, beside an already sad looking Tamarind i've had forever ( which was under potted for far too long before i stepped it up) is my Madre De Cacao (Gliricidia sepium). Drops it's foliage / most growth put on over the summer dies back quite a bit, but this happens w/ that plant every year. All the other test stuff i'd brought from FL is quite happy atm, despite the weather. Will loose the Tamarind for sure but no big deal.. Seeds are easy enough to come by later on. A neighbors much larger Tamarind looks perfect.. Her Cassia fistula has one small fried branch tip on one tree. Ficus benjamina in her yard, and some others around the corner from her look fine also, didn't seem effected by the cold we had earlier on. Weird as the current weather might seem to-us, i think the cold episodes have been just enough ..but not lasted long / been severe *enough* to do any real damage, ( for the most part ) this winter here.. Not trying to shrug off any damage others around town might see/ have seen, but no doubt the area has seen worse.. This year, colder? yea, wetter? thankfully, but doesn't seem all that bad, just dragged out / lingering.. however someone might describe it... My Torch Glows out front dropped a majority of their foliage, but are already thick with new growth, waiting to really start pushing once it warms back up.. Can tell some of my Plumeria may present issues w/ black tip once they start moving but no big deal if caught and delt with right away.. The one i put out front, and covered w/ pool noodles through the worst of earlier cold, looks great.. pushing some new leaves right now also.. Have to remember to paint the trunk again before mid-April. Sun exposure and the heat have been the bigger plant killers, at least for my time here..
Btw, keep forgetting to pass on to you, saw a video awhile back from someone located up your way .. in Waddel?.. i think? who'ed showed damage from the frost / freeze back in December at their place.. Pretty surprised to see what i believe were Delonix Regia being trialed up that way.. Think they also had a pretty large Boswellia sacra (Frankincense) in their yard also.. I haven’t seen the video but that is interesting if they do indeed have Delonix up out here. How did it look? Low of 26f during the 5 night event. Though, if they were closer to the mountains it may work alright. I notice it’s a consistent 3f warmer or so right on the foothills. I’m about a mile out and we’re in the open. The valley is sporadic with its temperature pockets. We seem to be pretty in line with south Chandler and Gilbert with lows. I have a friend in south San Tan and it gets cold out there. I predict I’ll see 2-3 more nights at freezing before the end of next week. Yea, also see a couple nights within the 34-31F range forecast for next week. For the moment, it looks like upper 60s-70s start returning around the 24-26th in the extended forecasts.. 12z GFS via T. Tidbits is even spitting out a day or two around 80F by the 2nd of next month atm.. Hopefully this won't change. Agree, a lot of temperature variation across the valley, even within neighborhoods. San Tan (..and Queen Creek) def. can run quite a bit colder than areas closer to where i am in Chandler. Even during the summer, i'd notice highs could be 2-4F cooler out where i worked in Q.C. compared to here at the house. Makes sense that some of the neighborhoods that are built up on the Foothills might stay a tad warmer than spots where cold air tries to settle. 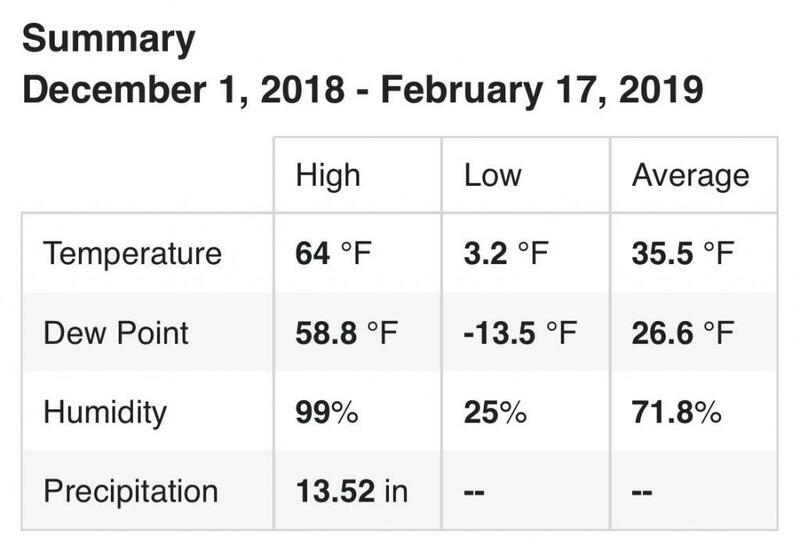 Lowest low i saw here was 26.4F during that event as well. From what i saw in the video, their Delonix Regia looked fried, but, to my eyes at least, damage appears mostly superficial. The owner states that their garden sits on 1/2 acre lot, but apparently is growing a whole bunch of tropical fruit trees, Fig varieties, Plumeria ( many that look like they def. took a hit this year ) among other stuff.. Didn't notice all that many palms though.. Enlightenment Garden is what the video(s) are under on youtube.. and yea, they're in Waddell, or was stated by the owner among feedback in one of the videos.. The following week. I’m not sure how much more my Royals can handle lol. Largest one is looking pretty sad right now. I got a similar forecast, but looks like lows in the 40s from Saturday onward. My Royal is looking a bit tired too from the wind and cool temps. High pressure needs to come back! Double checked my backyard in Orlando. 38F was lowest on one night. So close to having a 'cold' z11a winter. Avg of 64F since 12/1. 29 degrees colder than Orlando with similar precipitation. Zone 7a winter, average is 7b. Summer feels like a distant memory.